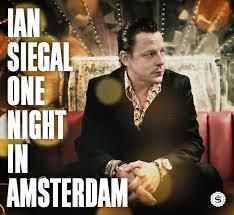 After a lifetime in the shadows; both Ian Siegal and British Blues are enjoying their time sparkling in the sunshine; and this Live album, recorded in April 2014 at the world famous North Sea Jazz Club in Amsterdam is very much the highlight of the Englishman’s career. With his young Dutch/German band right by his side like Wyatt Earp and his Deputies Segal comes out of the traps like a greyhound with a rip-roaring version of I Am the Train, from Candy Store Kid album and follows that with fan-favourite Brandy Balloon to drive the already excited fans wild. The 12 songs here come from all corners of Siegal’s career starting with Queen of the Junior Prom from 2002 through to the inspirational Early Grace from 2012 that slows the concert down to an intimate whisper and features some ultra-cool slide guitar playing. As a fan; I’d say this quartet that features Dutch guitar ‘wunderkid’ Dusty Ciggaar as good a way to hear Siegal’s sublime take on Chicago as any I’ve heard before; as they showcase his songwriting and magnificently gruff voice; and in return they all get the opportunity to showcase their own skills separately and collectively. While an Award winning songwriter himself, Siegal’s concerts always feature a couple of immaculately selected covers and here he throws a curve ball by including a bit of a Rocker called Writing on the Wall; by a little known Bluesman from Nottingham called Harry Stephenson alongside Tom Russell’s Gallo del Ciello, and neither sound out of place beside the Bluesman’s own work. Apart from the lack of in between song chat (a feature of his concerts) there’s not a single blemish here; and for a Live recording the sound quality is immaculate making One Night in Amsterdam timeless; and eminently listenable over and over again.